Ideas are the lifeblood of any organization. Without a constant stream of ideas for new products, productivity, quality, and process improvement, most organizations rapidly decline. However, few organizations practice idea management. Why? Because until now, there has not been an easy, effective way for all members of an organization to participate in continuous idea generation and development. 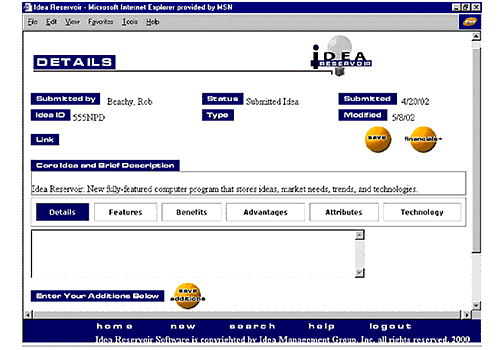 Idea ReservoirSM is an interactive knowledge management tool that helps your organization capture new product and service ideas. It also manages concepts from ideation through market release. Implement it in conjunction with your corporate intranet, or as a stand-alone solution, to provide a centralized repository for managing ideas. Highly customizable and flexible, Idea Reservoir is equally well suited as a basic employee suggestion box, or as a sophisticated product development tool. Please contact Axiom to discuss any specific needs.